The questions we get asked most often revolve around the confusion between Charlotte’s Web hemp extract oil, hemp seed oil, and marijuana. It’s natural. Unless you’re a botanist, marijuana and hemp look very similar, and people use the word "cannabis" interchangeably between the two. Also, people see hemp seed oil in the grocery store and assume that it’s the same thing as our Charlotte's Web hemp extract. We want to clear up some of the confusion and arm you with powerful health and wellness knowlege that will ultimately help you experience the benefits of Charlotte’s Web whole-plant phytocannabinoid hemp oil extract. Before diving in, a key component of this conversation is a crucial vocabulary word you'll see when researching hemp: phytocannabinoid. Phytocannabinoids are the primary chemical compounds produced by the cannabis plant. The two most well known phytocannabinoids are THC and CBD. To get started, let's clarify some common points of confusion between hemp and marijuana. Marijuana has > 0.3% THC (the only phytocannabinoid that gets you "high"). Charlotte's Web proprietary, non-GMO hemp genetics contain a unique combination of phytocannbinoids; it’s more than just CBD. 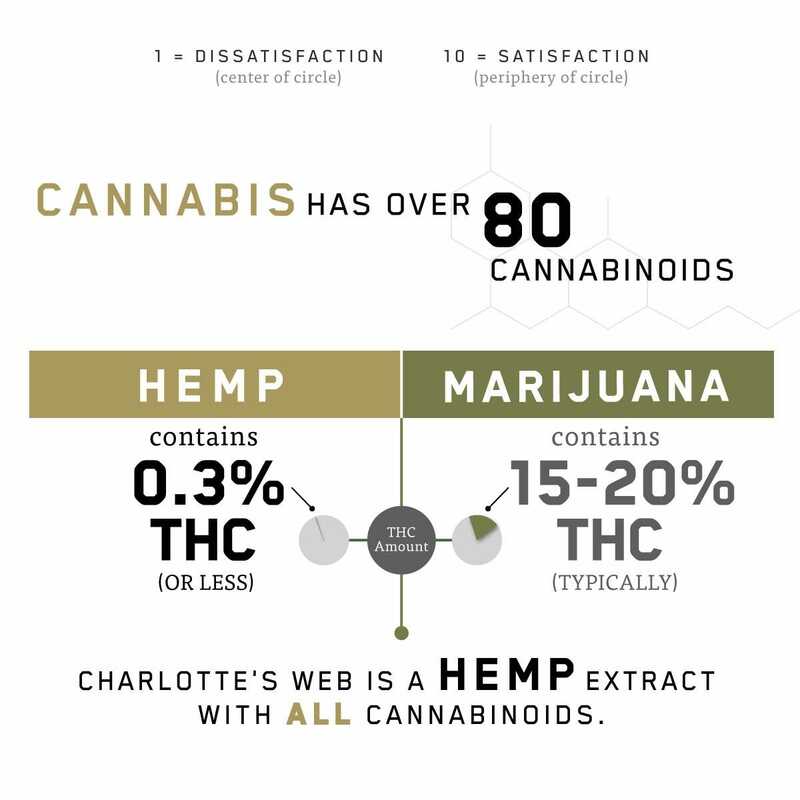 Charlotte's Web also includes naturally occurring terpenes, flavonoids, and other valuable hemp compounds that work synergistically to heighten positive effects, sometimes referred to as the “Entourage Effect,” making it more complete than single-compound CBD alternatives. Hemp seed oil is rich in omega fatty acids, but contains low levels of CBD or none at all. Hemp seed oil is used in cooking, beauty products, and as a bio-fuel source. Charlotte's Web hemp extract is made from the whole plant, while hemp seed oil is made from the seeds. Now that you know the differences between our hemp extract oil, hemp seed oil, and marijuana, we recommend that you always seek quality and consistent whole-plant phytocannabinoids for your optimal wellbeing. While world-class genetics are the foundation of Charlotte’s Web, quality is in the details. The production and quality of care that goes into Charlotte's Web products are unmatched. The process is overseen entirely by the founders of Charlotte's Web -- the Stanley Brothers-- beginning with cloning and hand-planting non-GMO plants on family farms, to manufacturing in an FDA-certified facility with 3rd party-verified Good Manufacturing Practices. It's this dedication that makes us The World's Most Trusted Hemp ExtractTM.